I’m a mom first, writer second. I dream of being that kind of fabulous mom who comes up with all sorts of crazy and memorable activities for my kids. Problem is, making up crazy and memorable activities takes lots of time and energy. And, well, writing just takes lots of time. Needless to say, when I find an activity to share with the kids I’m really excited. Not too long ago I had this brilliant idea that I would start teaching my kids about how to use a sewing machine. I learned how to sew when I was a kid and have been grateful for the skill all my life. 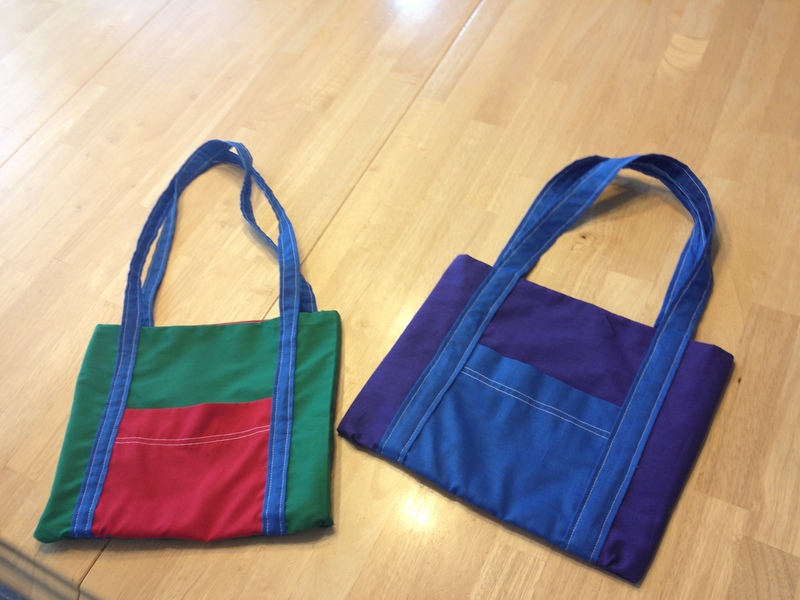 I had a simple project, a tote bag, and all the materials on hand. Showing my kids something new, where they actually make something useful, how cool is that? Mom of the year, here I come! Step one, cut out the pieces. Simple enough, right? I thought so. All the pieces were squares and clearly marked. I had looked forward to some quiet time while they sat and worked on this step. However, Mr. T couldn’t manage to cut even close to the line and was zigging and zagging all over the place. Miss K was determined to cut on the line but couldn’t get the scissors to work. Baby D was determined to give the scissors a try and nearly cut big holes into sister’s project. After a whole lot of whining, their’s not mine, I ended up cutting out the pieces while holding off baby and sending the other two off to play. Now that we’ve started I’m committed to finishing, but I’m having a sinking feeling that I might need some chocolate before this is over. The next step is to pin the pieces together. The idea of sewing pins and kids is a bit dicey, especially with Baby D roving around stealing whatever he could get his hands on. Miss K loved the idea of pinning so much she managed to get forty pins in the one foot section of cloth we were working on. Mr. T, on the other hand, couldn’t get the hang of pushing the pin in then back up again. Since it’s a straight line it’s not a big deal for me, but for beginners those pins really help do keep everything organized. Six demonstrations of how to pin later and no progress on his ability to do so, it’s time to move on. Cutting and pinning will never measure up to the golden trophy of getting to use mom’s awesome sewing machine. And boy, were they excited! I sat Mr. T in my lap and showed him the pedal and the needle and how it moved up and down. His job was to gently push the pedal while I guided the fabric through. So, naturally, he jammed his foot down on the pedal as fast and hard as it would go. He thought it was the funniest thing in the world. Repeated encouragement to knock it off didn’t help and after a few minutes I had to ask him to go off and play or risk turning his bag into an mangled mess. Miss K, on the other hand, demonstrated much more control and was thrilled to watch the different sides come together as she pushed the pedal. By the way, guiding fabric with a gazillion needles in it and a kindergartner at the pedal is far more exciting than it sounds. In the end, the project took much longer and much more patience than I had imagined. It’s going to be a long time and take a lot of convincing, and perhaps some more chocolate, before I teach another sewing lesson. For now at least I can say that I’ve exposed them to some of the process of sewing and it will be more familiar – should there be a next time.